USANA Australia is thrilled to welcome Australian Olympian Pistol Shooter Daniel Repacholi to Team USANA. Daniel is currently ranked #1 in 50 metre pistol and #2 in air pistol in Australia. His world ranking is #84 in 50 metre pistol and #134 in air pistol. Daniel said he is "very excited to come on board as a Team USANA athlete". 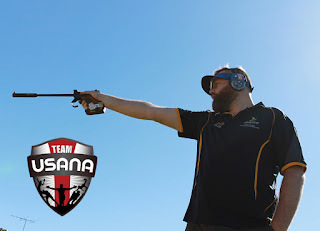 "With my high training and competition demands as an Olympic Pistol shooter, I need the best products available and these are definitely USANA products," he said. Daniel loves USANA’s Healthpak, Active Calcium, BiOmega, Procosamine, Visionex and Dutch Chocolate Nutrimeal. Daniel got involved in pistol shooting through his family when he was 12 years old, as a young child he would go down to the pistol club with his father and his brothers. At first he took this as an opportunity to spend some quality time with the family. He started off at club level and slowly found his way to state level and now after many personal achievements he sit at an international and Olympic level. The highlight of his pistol shooter career would be being a three-time Olympian and a two-time Commonwealth Games team member. He is also a two-time Commonwealth Games Gold Medalist, and a three-time Bronze Medalist. Daniel is a busy athlete as not only does he train 24/7, he works 14 hour shifts and comes home to his loving and understanding family. Each day is strategically planned in order to keep up with his busy lifestyle. He says his number one motivation when competing is his family, he believes once he is the Olympic Champion he gets to come home and spend some quality time with his supportive wife and two little girls. The advice that Daniel wants to give to upcoming athletes is that “competing for your country is one of the best feelings you will ever have and if you can do that at the largest sporting event in the world, like the Olympics than it is a truly amazing feeling". He said it's important to take care of yourself, and that "if you have a healthy body and a healthy mind nothing can stop you”. For more information on Daniel and his journey towards the Rio Olympic games don't forget to 'like' our Facebook page.